Warning: This is a film that will make you hungry! Last Sunday afternoon, with the rain setting in and a deadline looming, all I wanted to do was escape to the cinema and lose myself in an entertaining movie. And that’s what happened with ‘The Hundred-Foot Journey’. For those who like their films dark and serious, this is not the motion picture for you. Essentially it's light, fluffy and, dare I say, predictable. But, strangely enough, it's the film’s predictability that makes it comforting, much like a fragrant curry you cook on a cold winter’s day, knowing it will warm your tummy and boost your spirits. 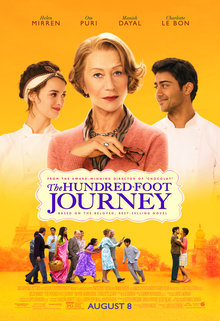 ‘The Hundred-Foot Journey’ is the story of the Kadam family, whose restaurant in Mumbai is burnt down in a riot, and who lose their beloved matriarch in the fire. They emigrate to the UK but find the English weather depressing. So they cross to the Continent where they buy an old van and drive south. As luck (or the screenwriter) would have it, the brakes fail on the outskirts of Saint-Antonin-Noble-Val, which just happens to be one of the most beautiful villages in south-western France. Papa, played engagingly by veteran Indian actor, Om Puri, has a little chat with his dead wife and decides to buy a rundown restaurant just outside the village. The only problem is that a hundred feet across the road is a ritzy Michelin-star establishment run by elegant widow, Madame Mallory. You can already see where it’s heading, can’t you? The perfect movie for baby boomers – in the spirit of ‘The Best Exotic Marigold Hotel’. Throw in Papa’s good-looking younger son, Hassan Haji, who’s a talented but untrained cook, and Marguerite (Montreal-born Charlotte Le Bon), the pretty sous-chef at Mme Mallory’s restaurant, and you have something for the Gen Y members of the audience as well – not that there was anyone under fifty in the cinema last Sunday. Initially, of course, there’s a clash of cultures and food styles – Mme Mallory’s restrained French elegance versus the Kadams’ earthy joie de vivre; the Frenchwoman’s classic haute cuisine and tastefully decorated restaurant in contrast to the hearty dishes, loud music and vibrant colour scheme of the Kadams’ courtyard eatery. The antagonistic exchanges between Papa and Mme Mallory which arise from these differences are a delight to watch. At first though, I did wonder why the very English Helen Mirren had been cast in the role of Mme Mallory when there are plenty of famous French or French-Canadian actresses d’un certain âge (the lovely Isabelle Huppert, for example, or Geneviève Bujold) who could have played the part. Yet I concede that Mirren’s French is rather good, even to mastering the difficult uvular ‘R’, and so is her accented English. There were just a few occasions, however, when I was looking at her in profile with her shortish curled hair and suddenly saw the Queen! Fortunately those moments were brief and infrequent. It’s Om Puri's Papa with his velvety voice and gruff charm who holds this film together. I have to confess I’d never heard of him before reading the credits, and I had to Google him to learn about his prestigious career. It turned out I had seen him before, a much younger version of himself in ‘The Jewel in the Crown’, a miniseries I enjoyed back in the Seventies (with the gorgeous Art Malik). As a foodie, I loved the food preparation scenes. The timing of the film was perfect for me too, considering I’m in culinary withdrawal following the end of the ‘Master Chef’ season. Like the popular TV reality show, this film celebrates the psychological aspects of cooking and eating, the fact that certain dishes evoke special memories. As Hassan’s mother tells him at the start of the film: ‘When you cook, you make ghosts.’ Mama doesn’t mean scary ghosts, she’s talking about pleasant echoes of the past. And it’s true, isn’t it? A roast leg of lamb with mint sauce can still summon up memories of my grandmother and her perfectly laid dining table. The enticing smell of golden syrup gently heating in a saucepan can take me back to my mum making batches of ANZAC biscuits to put in our school lunches. Food isn’t incidental to this film. It’s ever-present and warmly evocative. I swear there were times when I could actually smell the cardamom, coriander and cumin. And I’d never realised that the making of Hollandaise sauce could be so sensuous. Like a fragrant curry, ‘The Hundred-Foot Journey' is both comforting and delicious. Recommended for those who like heartwarming, feel-good films. I was privileged to be part of this year’s Festival, named in honour of social reformer and suffragist, Rose Scott, co-founder of the Women’s Club and a key figure in the women’s suffrage movement. Coincidentally, Rose makes a cameo appearance in my novel, ‘The Jade Widow’ as a mentor to my aspiring doctor, Eliza Miller. The Festival took place over two days, beginning on Friday with a literary lunch featuring Annabel Morley, daughter of renowned actor and raconteur, Robert Morley, and grand daughter of actress, Dame Gladys Cooper. Annabel is the author of a delightful memoir entitled ‘The Icing on the Cake' about growing up in a theatrical family. Saturday’s program commenced with a musical introduction from the talented Lindsay Drummond who composed and sang a moving tribute to Rose Scott. Then it was time for my conversation with author and presenter, Jenny Strachan (both of us wearing suffragette colours of violet, white and green). We discussed the historical figures who appear in ‘The Jade Widow’: Rose Scott, naturally, plus Dagmar Berne (Australia’s first female medical student), Quong Tart (merchant, philanthropist, community leader) and politician, Sir Henry Parkes. Following a coffee break, Lisa Forrest introduced Blanche d’Alpuget, whose latest book, ‘The Young Lion’, is the first novel in a series about the House of Plantagenet. I was particularly interested to hear Blanche’s approach to researching and writing historical fiction and found myself so excited by what she had to say about her story and its characters (Eleanor of Aquitaine, Geoffrey, Duke of Normandy, and his son, Henry, among others) that I just had to buy her book at the end of the session. After the lunch break we returned to hear Michaela Bolzan in conversation with one of Australia’s most beloved novelists, Judy Nunn, who spoke about creating a sense of place in her novels and also shared some funny and fascinating anecdotes about her writing life. I especially enjoyed her insights into how being an actor enhances her work as a writer. Last but not least, we heard from art historian and author, Susan Steggall about her art-mystery novel called ‘It Happened Tomorrow’ which sounds so intriguing that I can’t wait to read it. Sue also spoke about her experience of living in France and how this has found its way into her writing. Huge congratulations to creative director, Michaela Bolzan and producer, Margaret McKay, together with Jennifer Scott, Jenny Strachan and all the team at the Women’s Club for organising such a friendly and stimulating event. May there be many more! Who is your favourite fictional heroine? Thank you to everyone who entered the Giveaway – I really enjoyed reading through your choices. Most of the heroines that you’ve chosen have come from the pages of novels for children or young adults - beloved characters such as Anne Shirley, Jo March, Mary Poppins and Pollyanna. Which goes to show that the characters we meet in our formative years tend to be the ones who make the strongest impression on us. Kim M from the Sunshine Coast of Queensland, who chose L. M. Montgomery’s wonderful Anne Shirley, better known as Anne of Green Gables, as her favourite heroine. If you didn’t supply your contact address in the entry email, would you kindly drop me a line via the Contact page with your details. Also, please let me know the name you’d like me to include when I sign your prize. Once I’ve gift-wrapped your prize, it will be winging its way to you by Australia Post. Disclaimer: This giveaway was not sponsored, endorsed or administered by, or associated with Facebook in any way. When a cinema audience applauds at the end of a film, you know they’ve enjoyed it in a big way. That’s what happened yesterday when I saw ‘Jersey Boys’, the bio-pic about Frankie Valli and the Four Seasons, adapted from the musical of the same name. Admittedly, the audience consisted almost exclusively of Baby Boomers and older Gen Xers, the very people who grew up with the catchy music which made the Four Seasons famous. But I have a feeling that whatever the demographic of the audience, they would have found this a highly entertaining movie. Now for some stats. This is the thirty-third film that eighty-four-year-old Clint Eastwood has directed. And yes, I admit I’m an Eastwood fan. If you thought he could only make Westerns, think again. This guy is versatile in the extreme – he can direct any genre. One of the best thrillers ever made (and an archetype for thriller-makers to come) was Eastwood’s directorial debut, ‘Play Misty for Me’, in which he also starred. And if you’re puzzled about Clint directing a musical, he’s no tyro when it comes to music. He included a long (some might say over-long) sequence in ‘Play Misty for Me’ set at the Monterey Jazz Festival. And in the eighties he directed ‘Bird’, the bio-pic about Charlie ‘Bird’ Parker, the quintessential jazz saxophonist. Clint is wise enough to approach his latest film with a light hand, allowing his talented team of actors to do their thing and the musical soundtrack to propel the action. The theatrical origins of 'Jersey Boys' are obvious in the way the characters address the audience directly at key points in the story. But rather than detracting from the film, these direct-to-camera moments add to its richness. And I love the final ensemble number which could have come straight out of a theatre and spilt onto the street. The performances are perfect in every respect. That’s why it’s hard to single out anyone for special notice. Having said that, John Lloyd Young, who was in the original Broadway cast, is outstanding as Frankie Valli, short in stature but endowed with a good heart and an amazing voice. Erich Bergen is great too as the immensely talented songwriter/performer Bob Gaudio. Jut-jawed Vincent Piazza as Tommy de Vito captures the bravado and vulnerability of the founding member of the band. And Christopher Walken was born to play the mob boss who’s very scary but also possesses a sense of humour as indicated by a raised eyebrow or the briefest of Walkenian smiles. Being a movie buff, I loved Joey Russo playing a very young Joe Pesce, yes, the famous Joe Pesce of ‘Goodfellas’ fame, but before he became an actor, when he was just Tommy de Vito's buddy. The look of this film is perfect too, especially the early scenes set in the 1950s in Belleville, New Jersey. Eastwood has used sepia and olive tones to capture the atmosphere of the Jersey streets. There are many natty touches in the set design. For example, when we first enter Frankie’s home, the camera pauses briefly on a gilt wall clock with framed portraits flanking the dial. On one side, as you’d expect, there’s a picture of the Pope; on the other, who else but Frank Sinatra? Every Jersey boy, and particularly anyone who could sing, wanted to grow up to be Frank. One of the best lines in a screenplay full of pithy dialogue is spoken by Frankie’s first wife, Mary Delgado (played by Renée Marino). Frankie tells her he wants to change his name from Castelluccio to Vally but she tells him firmly that it has to be spelt ‘Valli’ with an 'i' because Italian names have to end in a vowel. I couldn’t finish this review without mentioning the costumes. I expect this film to be nominated for an Academy Award for Costume Design. In fact, Frankie Valli’s array of sweaters deserve an award of their own. 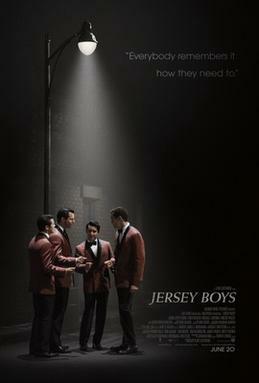 So, if you have a spare couple of hours this coming weekend, I’d recommend Eastwood’s ‘Jersey Boys’. You’ll be humming along with the songs (‘Sherry’, ‘Rag Doll’, ‘Oh What a Night’, ‘Big Girls Don’t Cry’) and tapping your feet to the rhythm. And if you’re like me, the melodies will linger in your head long after you leave the cinema.